You can say "awww" first. Then you can look at the price tag of 15,760 yen (about $160) for one. Holy cow. 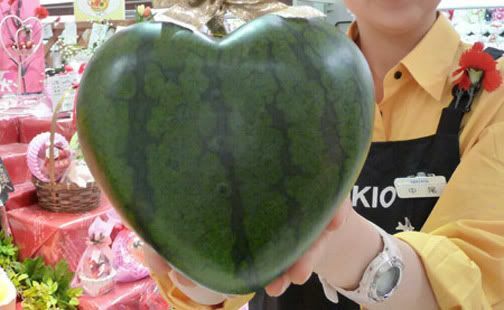 It took the Japanese couple 3 years to perfect, but they finally produced perfect heart-shaped watermelons and will surely be producing more in the future for such high prices. thats unbelieveable....what people will do and spend time on for money...sheesh....still cool. I don't think I'd be able to eat it. the photograph is good enough for me. Who knows, Chris? The Japanese seem to always be finding something new and creative to do, so maybe they just saw one that looked similar to a heart one day and ran with the idea!